Darmstadt, Oct. 7 -- In the presence of a notable gathering, which included an Emperor, an Empress, a King, and two Queens, the marriage of Princess Alice of Battenberg  and Prince Andreas of Greece  was celebrated today according to the rites of the Lutheran and Greek churches. The wedding party, whose dresses and uniforms made a very effective spectacle, assembled at 3:30 in the old castle, and then crossed the castle yard to the castle church. Prince George of Greece  with Princess Victoria  led the procession, and they were followed by the Grand Duke of Hesse , with the Czarina ; the Czar , with Queen Alexandra ; the members of the Greek royal family, and finally Prince Louis of Battenberg , with his daughters, the Princesses Alice  and Louise . The church was filled with diplomats, the local authorities, and the royal suites. The Protestant ceremony lasted three-quarters of an hour, the officiating clergyman being the Rev. Dr. Petersen. The party then, amid the ringing of the famous chimes, drove in reverse order to the Greek chapel, a mile distant on the Mathildanhohe, where they were greeted by a large crowd. There the marriage ceremony was celebrated according to the Greek rites by Archpriest Janitcheff, a Russian choir performing the musical service. All then returned directly to the palace. The bride wore white crepe de chine, with orange blossoms, and a bodice of Point de Venise lace. Queen Alexandra was dressed in purple tulle, with sequins, and had a diamond diadem. The Czarina wore a gown of white tulle embroidered with silver, and wore a Russian diadem. The Queen of Greece was in gray satin. A family dinner was held this evening, with forty-two covers. Afterward the wedded couple started in a motor car, presented by the Czar, for Heiligenberg Castle on a short honeymoon. The gifts to the bridal couple include a massive silver epergne from the King and Queen of England and a magnificent diadem of brilliants from the Czar and Czarina . The civil marriage of Prince Andrew and Princess Alice took place on Tuesday. 1. Princess Andrew of Greece and Denmark (1885-1969), born Princess Alice of Battenberg, was the elder daughter of Prince Louis of Battenberg and Princess Victoria of Hesse and by Rhine. Through her mother, she was a great-granddaughter of Queen Victoria and Prince Albert. She had five children, including the Duke of Edinburgh; she lived a remarkable, complicated life. 2. 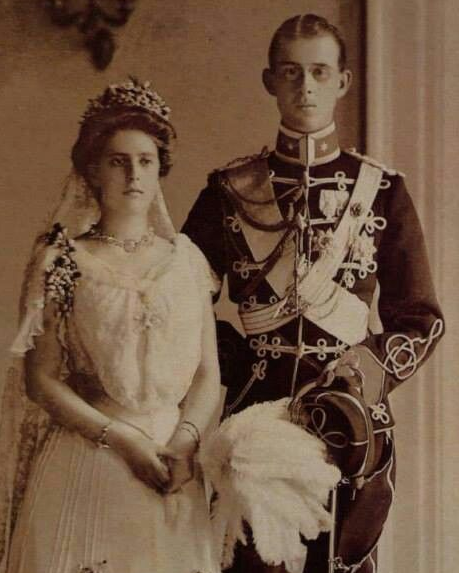 Prince Andrew of Greece and Denmark (1882-1944) was the seventh child of King George I and Queen Olga of Greece. He met and fell in love with Alice at the coronation of King Edward VII and Queen Alexandra of the United Kingdom in 1902. 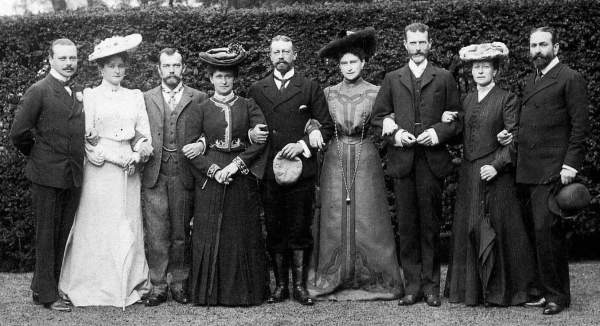 Queen Alexandra was Andrew's aunt; King Edward was Alice's great-uncle. 3. Prince George of Greece and Denmark (1869-1957) was the groom's elder brother. He was married to Princess Marie Bonaparte but also had a long-lasting, very complex relationship with his uncle, Prince Valdemar of Denmark. 4. Princess Louis of Battenberg (1863-1950), born Princess Victoria of Hesse and by Rhine, the eldest daughter of Grand Duke Louis IV of Hesse and Princess Alice of the United Kingdom (the second daughter of Queen Victoria and Prince Albert). Following World War I, when her husband was stripped of his German title, Victoria was known as the Marchioness of Milford Haven. 5. Grand Duke Ernst of Hesse and by Rhine (1868-1937) was the bride's uncle. He was the younger brother of Princess Victoria of Hesse. Ernst had been married to another grandchild of Queen Victoria, Princess Victoria Melita of Edinburgh, but two years before this wedding, they divorced. A little over a year after Alice and Andrew's wedding, Ernst married again, this time to Princess Eleonore of Solms-Hohensolms-Lich. Their son, Georg Donatus, would eventually marry Andrew and Alice's daughter, Cecilie. 6. Tsarina Alexandra Feodorovna of Russia (1872-1918), born Princess Alix of Hesse and by Rhine, was the bride's aunt. She was the youngest living sister of Princess Victoria of Hesse. I'm thinking you all know what happened to her, but just in case: hemophilia, Rasputin, revolution, murder. 7. Tsar Nicholas II of Russia (1868-1918) was the groom's first cousin; his mother, who was born Princess Dagmar of Denmark, was the sister of King George I of Greece. Again, I'm thinking you all know what happened to him; see above. 8. Queen Alexandra of the United Kingdom (1844-1925), born Princess Alexandra of Denmark, was the groom's aunt; she was the sister of King George I of Greece. 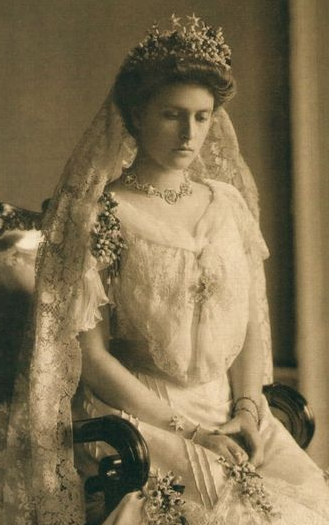 She was also the bride's great-aunt, as her husband, King Edward VII, was the brother of the bride's grandmother, Princess Alice of the United Kingdom. 9. Prince Louis of Battenberg (1854-1921) was the bride's father. He had a German princely title (his father was a Hessian prince), but he served in the British royal navy, even becoming First Sea Lord in 1912. He relinquished his German title in the wake of World War I and adopted the Anglicized surname "Mountbatten"; King George V subsequently made him the Marquess of Milford Haven. His children were all prominent 20th century royal figures: Princess Andrew of Greece, Queen Louise of Sweden, Earl Mountbatten, and George, 2nd Marquess of Milford Haven. 10. This is Princess Alice, the bride. 11. Princess Louise of Battenberg (1889-1965), younger sister of the bride. She became Lady Louise Mountbatten when the family's German titles were removed in 1917; six years later, she married the widowed Crown Prince Gustaf Adolf of Sweden and eventually became Queen Louise of Sweden. 12. This bit of information raises an interesting question: which of Alice's tiaras was the Russian gift? There are photographs of Alice wearing four tiaras during her lifetime. 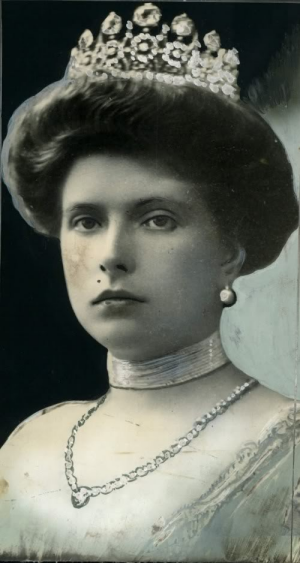 The first, her wedding tiara, never belonged to her; it was borrowed from her mother, Princess Victoria, and was lost in Russia during the revolution. 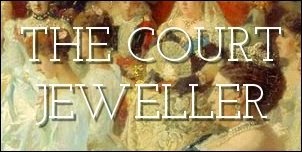 The second "tiara" was actually Alice's wedding necklace set on a frame; I've seen it stated that the necklace was Alice's wedding gift from her mother. That leaves two tiaras that belonged personally to the princess: the meander tiara that now belongs to Princess Anne, and the diamond tiara that was broken up in the late 1940s for Queen Elizabeth II's engagement ring and wedding bracelet. By the description of the piece as a "magnificent diadem," I'm guessing it's the latter, which was quite large, rather than the small bandeau-style meander tiara. The photographs of Alice wearing the larger diamond tiara are also from an earlier period of her life than the photographs showing the meander tiara. Any and all thoughts on this subject are welcome in the comments!